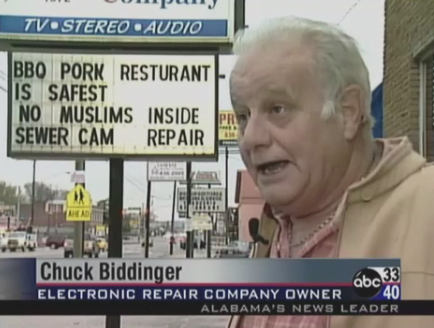 In some ways, I applaud Biddinger. I’d love to see more jokes next time I’m driving down the highway. However, just because something one of your dumb buddies sent you in an email was funny, it doesn’t mean it needs to go up there. Here’s a good test to keep in mind. Next time you’re considering a new joke to use, take a friend out to a public place and tell it to them loudly. If you feel the need to look over your shoulder and see who’s around before you start telling it, then it’s probably a bad joke to use. Probably the most disheartening moment in the video below from ABC 3340, is when the news crew interviews local residents on whether they find the joke funny or not and half respond in the affirmative. Fortunately, it appears they only asked two people at a gas station while on the drive back to the station. Let’s hope the rest of the town has better stats.